"Overall, my visit to Baltistan was incredible. The students and citizens of this region are full of hope for their futures, but are in need of technical support and resources to help them achieve this vision of excellence," explains Kate Anderson Simons, who has been supporting GRACE Association Pakistan as an online volunteer since 2007. An education consultant focusing on children affected by poverty, armed conflict, and lack of educational opportunities, she hopes that "through continued collaboration, the GRACE staff, partners, and volunteers can make this vision a reality." Skardu, Pakistan: I first connected with GRACE Association Pakistan in 2007 through the UNV Online Volunteering service. At the time, GRACE Association was seeking proposal-writing support for its early childhood development programming in Skardu, Baltistan. Through this opportunity, I learned about the community of Skardu and the surrounding areas. When Khadim Hussain, the organization's Chief Executive, first asked me to visit in 2008, I was concerned about the security situation there because the North American news media was reporting only on the violent episodes in Pakistan. However, through talking with people like Khadim, and researching education in Pakistan while working at the Brookings Institution, a different picture began to emerge. I saw a country where education was highly valued and human resources were needed to further the momentum toward education in the communities. I learned that, just as in the United States, there were areas that were less safe and areas that were very safe. I was even told by a colleague who had visited Skardu that it would be more secure there than in many parts of my home of Washington, DC. I realized the media had painted an inaccurate picture of Pakistan, and North Americans would continue to believe these inaccuracies if they had no access to real information. In January 2011, I decided it was time to start planning my trip to Pakistan and Skardu. When I arrived in the breath-taking Skardu valley, I knew this long journey was well worth the time and effort. I took steps to blend into Pakistani culture, including wearing shalwar kamiz and covering my head with a dupatta. I did this not because I felt it was required, but in respect for the local customs, and in turn I received respect from the people I met. Reading the organization newsletter The Voice of Grassroots and following GRACE Association on the website and Facebook, I had an idea of the work the organization was doing in Skardu. However, meeting the people behind the work and seeing the evidence in the field, I realized there was much more to the story. GRACE Association plays a prominent role in the community, and its leaders have a tremendous amount of social and political capital in the region. These relationships ensure that projects are aligned with community needs and completed satisfactorily. 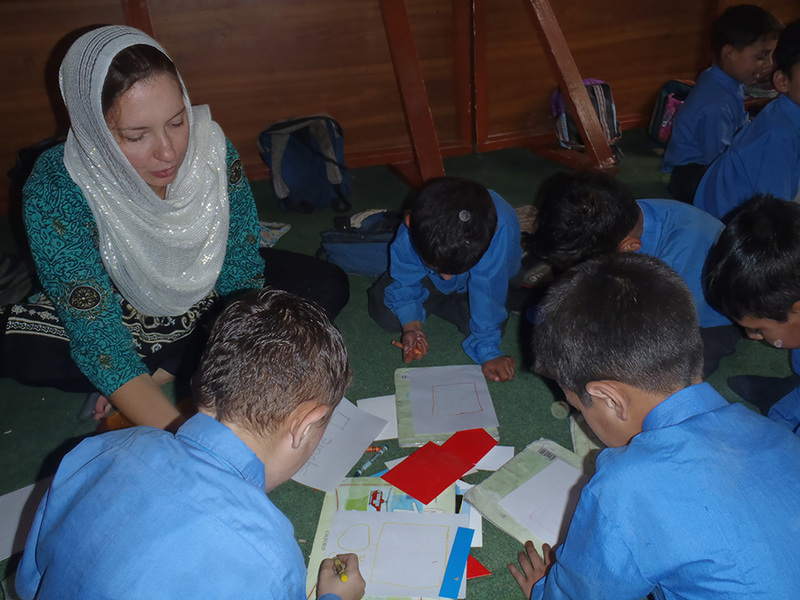 My own background is in early childhood development, and the primary purpose of my visit was to work with teachers and the school's administration to build capacity at GRACE Public School Skardu. I spent the first day observing the teachers, and I found that the relationships between students and teachers, and among students, were very strong. Children feel comfortable coming to the teachers with questions and the teachers are dedicated and willing to try new strategies in their work. The next day I facilitated a workshop on enriching learning experiences. We talked about providing learning experiences that incorporated a variety of learning styles (seeing, listening, doing, touching, moving, etc.). During this workshop, the GRACE Public School Skardu teachers, principal and Khadim developed a vision for high-quality primary education, and we discussed the pathways to achieving that vision. Next, we planned a series of activities for small groups of children in the nursery and prep classrooms (children aged three to five years), taught by teachers. We incorporated teacher-developed materials such as letter and picture cards, and recycled materials such as bottle caps for learning, counting, sorting and patterning. On Thursday, we launched the new activities, and while it was a lot of work, teachers noted that the children were very interested in learning and that they were "learning through playing." Finally, on Friday we worked on organizing the classroom and said goodbye. I will be conducting live trainings for the GRACE Public School Skardu staff via Skype, which will be projected onto a screen in the school. This will help us maintain the relationships that we developed until I am able to visit again. This experience demonstrated to me that through building relationships and leveraging existing community resources, collaborations between ordinary citizens and under-resourced communities can have significant impacts on both parties. On my last day in Islamabad, Khadim and I began brainstorming ways to bring this model of collaboration to other community based organizations. The result of our efforts was a plan for establishing the Grassroots Global Foundation. This organization exists to empower grassroots organizations such as GRACE by connecting them with experts, funders, and ordinary citizens that can help them further their missions. We also work to advocate on behalf of indigenous NGOs, recognizing their deep relationships and community knowledge as vital to development in the most remote areas of the world. Overall, my visit to Baltistan was incredible. The students and citizens of this region are full of hope and ambition for their futures, but are in need of technical support and resources to help them achieve this vision of excellence. I am hopeful that through continued collaboration, the GRACE staff, partners, and volunteers can make this vision a reality. Kate Anderson Simons is a UN Online Volunteer.